HORRY COUNTY, SC (WMBF) – The former deputy chief of police for the Horry County Police Department resigned earlier this year after an Internal Affairs investigation revealed that he lied about ordering an employee to drop 53 open investigations, documents show. HCPD originally announced that he retired after 33 years with the department. 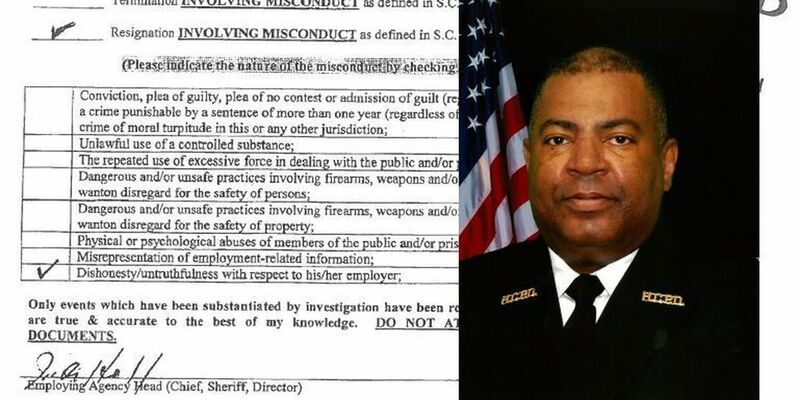 Maurice Jones' resignation on June 30 involved misconduct - specifically, dishonesty and untruthfulness with respect to his employer, according to a Notification of Separation Due to Misconduct from the South Carolina Criminal Justice Academy that was obtained by WMBF News. "Deputy Chief Jones ordered an employee with the Horry County Police Department to administratively close 53 open cases without any type of investigation. When Deputy Chief Jones was asked about this by IA, Deputy Chief Jones said he never ordered that to be done. Through the IA investigation it was determined that Deputy Chief Jones was being dishonest and untruthful." Chief of Police Joseph Hill confirmed that those 53 open cases belonged one or more of Jones' subordinates, which included former HCPD employees Detective Allen Large, Detective Todd Cox and Sergeant Lucas Green, all of whom now face charges for misconduct in office. Large was fired, Green resigned, and Cox retired. Chief Hill said those dropped cases are now back open and being investigated. While Chief Hill would not comment on Jones directly, he spoke to Reporter Meredith Helline about keeping the integrity of the department. The personnel report lists June 30 as Jones' date of separation from the department. The Horry County Police Department told WMBF News on June 17 that Jones would retire on July 1. Jones' separation document was signed by the Chief of Police Joseph Hill on July 5. Jones had served the department for 33 years, HCPD spokeswoman Krystal Dotson said on June 17, adding, "We are grateful for his years of dedicated service and wish him a very happy retirement." The documents from the South Carolina Criminal Justice Academy indicated that the separation notice was delivered to Jones via certified mail, and that he was given the opportunity to respond. WMBF News reached out to Jones over the phone; he said he never received the certified mail from the SCCJA. However, online tracking information indicates the letter was delivered on August 4. Reporter Patrick Lloyd spoke to Jones off camera, where he reiterated that he retired effective July 1. He said he was thrown a retirement party and is receiving retirement benefits. When asked about the 53 open cases he allegedly ordered dropped, he made it clear there is difference between an open case and an administratively open case. He acknowledged that he did receive the letter from the SCCJA in August, but is starting the appeals process with the SCCJA. Watch extended video of our interview with Chief Hill in the WMBF News App. Click here to download it, then head to the "App Extras" section to watch that video.